There’s a lie that will fight you. It acts like it loves you. It might seem like a good thing. You might feel like you have control. It might feel like you’re finally getting everything right. But watch out, because skinny will lie to you. She doesn’t love you. She’s not trying to make you beautiful. You may not see it now, but if you follow skinny all the way through, she will make you sick, and she will make you skinny, but you’ll never know it. She will tell you aren’t every time. More people have the mentality of an eating disorder, who couldn’t be diagnosed because of their weight. 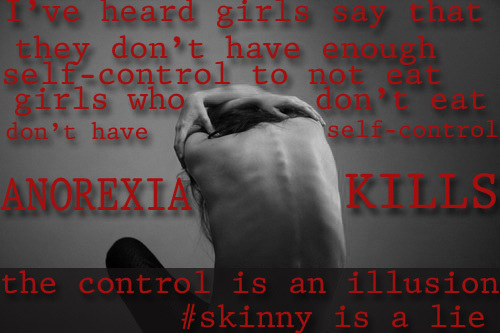 You don’t have to be dying of starvation to have been abused by the lies of skinny. If you’ve ever felt that you’re too big to be loved, you eat too much to be pure, that you aren’t beautiful because you aren’t “skinny,” you have been lied to by skinny. Skinny can’t complete you, neither can food. Diets won’t save you. They’re lying. These things can be good, but if you worship them, they will take you in alive. Don’t let your diet make you a slave. 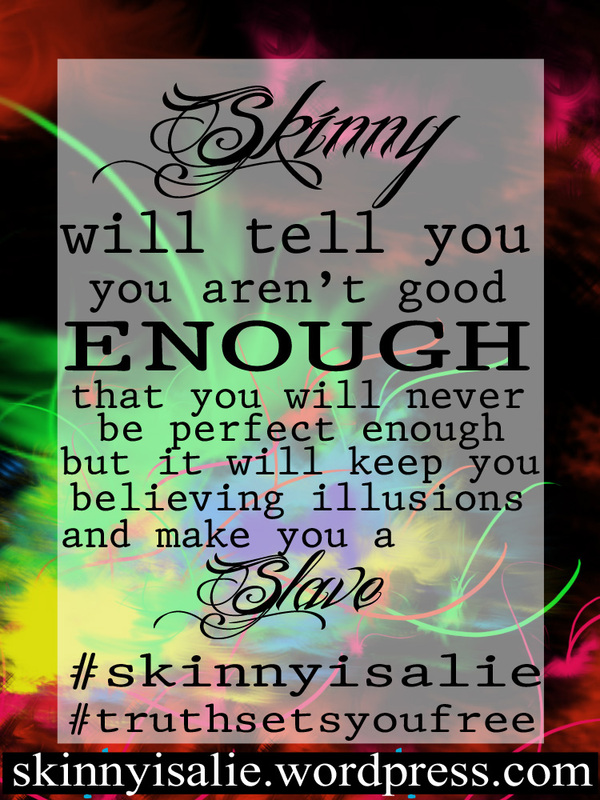 Don’t let skinny make you a slave. In Jesus there is freedom, there is love. He will help you be healthy in every possible way. He makes you beautiful. his control can be trusted. The only one who I am willing to serve, who is worthy to be served, is Jesus Christ. He will never abuse you. He will set you free. John 8:35-36 “Now a slave has no permanent place in the family, but a son belongs to it forever. So if the Son sets you free, you will be free indeed.” When you are a slave to skinny, or another one of the lies, you will never be good enough for them. You will never be in the family. Satan doesn’t want to accept you, and these are his lies. Satan wants to turn you away from the truth. The truth about freedom, love, redemption, grace, and acceptance. The truth about Jesus. The truth that you are BEAUTIFUL, that you are WORTH IT, that you are LOVED. When you submit your self to Christ, the son, He will set you free from darkness, from the cages of bone you live in, from the leash of food you are chained to, from the feeling that you have to get on another diet to make yourself presentable, to make yourself good enough. This MINDSET will be gone when you surrender to Christ. I used to think that Jesus freedom meant I had to constantly fight these things in my life. When I surrendered to Him completely, the mindset was gone. I was FREE! 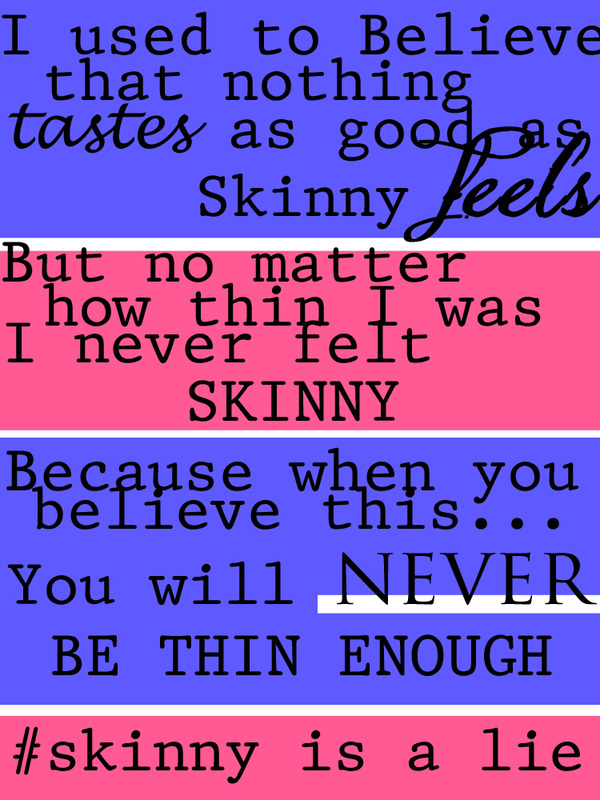 I didn’t feel like I had to be skinny anymore, I didn’t believe that skinny felt good. I felt ALIVE, I had ENERGY, I had JOY. Things that SKINNY NEVER LET ME HAVE. Being a slave to Jesus is the only way to be free; he is true enough to be served in every aspect. Nothing else will do. Nothing else is enough. Skinny will never be enough. Food will never be enough. Health can’t save you. Jesus makes you beautiful. Jesus fills you up. Jesus saves you. He’s the only one who can forgive your sins. He’s the only one who can really comfort you. He’s the only one who completes you and makes you perfect. He’s the One. And SKINNY IS A LIE. 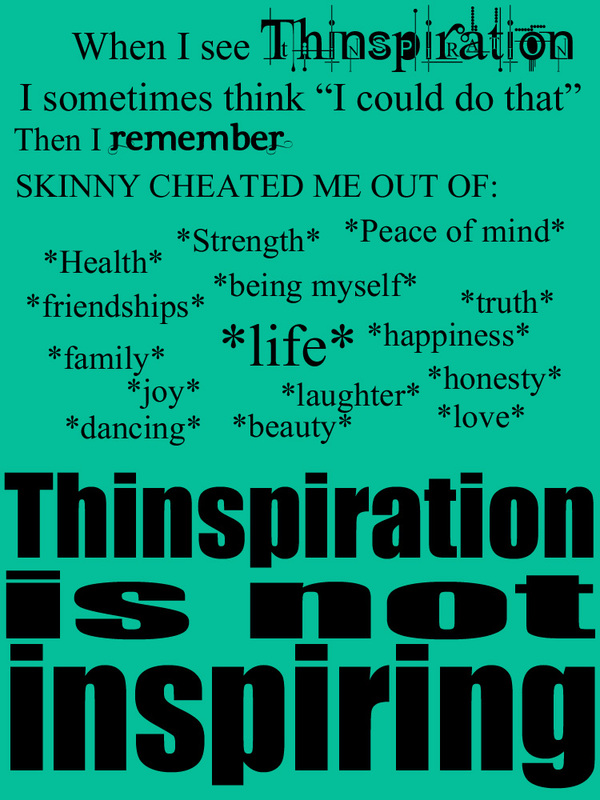 Everywhere I see the “thinspo” I see posters that have weight loss “inspiration.” Many of the girls in the pictures don’t look inspiring. They are pictured with words about how being skinny will make you perfect, being skinny will make you happy. None of these girls look happy, many of them are ridiculously bony and have scrawled sharpie on their bodies saying “fatty” “Imperfect” “ugly”. These girls aren’t happy. 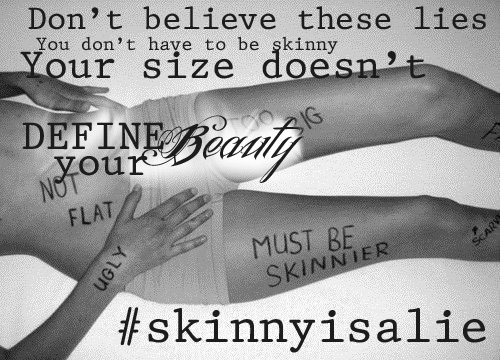 Skinny will not make you happy, it won’t make you beautiful, and it won’t make you perfect. The skinny you see in magazines, on pinterest, advertised is rarely healthy. Skinny, if followed through, gives birth to death. I recently saw a picture of a girl pinned that I had seen before. This time I saw her pinned with the words “inspiration” the last time I saw her picture it was in a story her sister wrote, the girl had recently passed away from starvation with the photo was shot. The skinny lie will only make you unhappy, feel imperfect, hate yourself. I believed the lie. I was very sick for a long time. I was paranoid about people, about food, about everything. These lies eat you up from the inside. 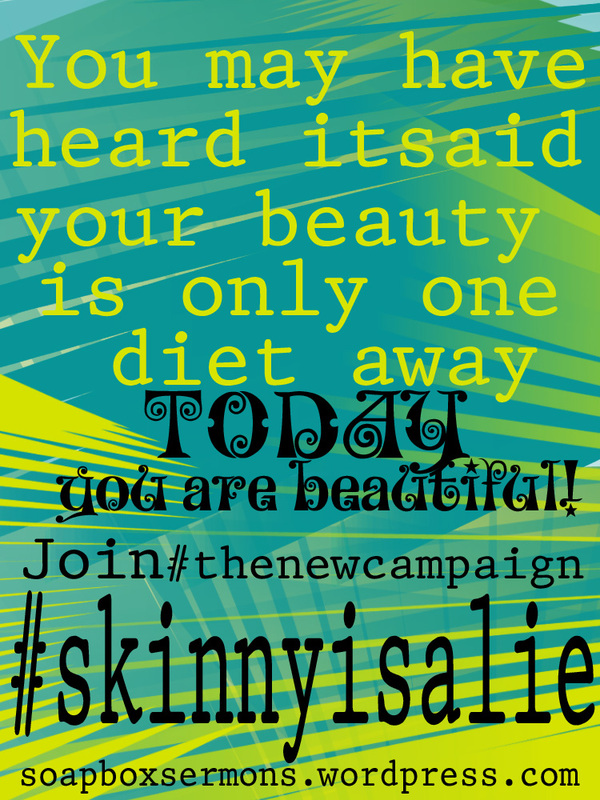 Don’t put faith in SKINNY!